Once you make these changes, your app can receive the SEARCH_ACTION intent containing the SearchManager.QUERY extra with the search expression. This feature is available on English locale Android devices running Jelly Bean and above with the Google app v3.5 or greater. Last but not least, users can enable the Ok Google hot-word detection from any screen, which offers them the fastest route between their search command and your app! Happy Tuesday! We've had a few questions come in recently regarding Google Accounts on Android, so we've put this post together to show you some of our best practices. The tips today will focus on Android-based authentication, which is easily achieved through the integration of Google Play services. Let's get started. // createLocalAccount() is specific to the app's local storage strategy. While it is OK to store the email address for display or caching purposes, it is possible for users to change the primary email address on a Google Account. This can happen with various types of accounts, but these changes happen most often with Google Apps For Work accounts. This will key the local data against a Google Account ID, which is unique and stable for the user even after changing an email address. So, in the above scenario, if your data was keyed on an ID, you wouldn’t have to worry if your users change their email address. When they sign back in, they’ll still get the same ID, and you won’t need to do anything with your data. If your app supports multiple account connections simultaneously (like the Gmail user interface shown below), you are calling setAccountName on the GoogleApiClient.Builder when constructing GoogleApiClients. This requires you to store the account name as well as the Google Account ID within your app. However, the account name you’ve stored will be different if the user changes their primary email address. The easiest way to deal with this is to prompt the user to re-login. Then, update the account name when onConnected is called after login. Any time a login occurs you, can use code such as this to compare Account IDs and update the email address stored locally for the Account ID. // are all specific to the app's local storage strategy. // Existing local data for this Google Account. This scenario reinforces the importance of using the Account ID to store data all data in your app. If you don't make Google API calls from your web server, you might be able to depend on the Android application to notify your web server of changes to the primary email address when implementing the updateLocalAccountName method referenced in the multiple accounts sample code above. If you make Google API calls from your web server, you likely implemented it using the Cross-client authentication and can detect changes via the OAuth2 client libraries or REST endpoints on your server as well. When using Google Account authentication for your app, it’s definitely a best practice to use the account ID, as opposed to the account name to distinguish data for the user. In this post, we saw three scenarios where you may need to make changes to make your apps more robust. With the growing adoption of Google for Work, users who are changing their email address, but keeping the same account ID, may occur more frequently, so we encourage all developers to make plans to update their code as soon as possible. 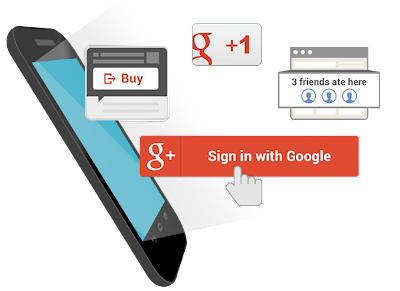 Since we published this post in 2014, we’ve made a lot of updates to the Google Sign-In APIs, deprecating much of this information. Android 5.0 brings in material design as the new design system for the platform and system apps. Consumers will soon start getting Android 5.0 and they’re already seeing glimpses of material design with apps like Google Play Newsstand, Inbox by Gmail and Tumblr. Meanwhile, developers now have the Android 5.0 SDK, along with AppCompat for backward compatibility. And designers now have access to Photoshop, Illustrator and Sketch templates. All this means that now—yes now!—is the time to start implementing material design in your Android apps. Today, let’s talk about what implementing material design really boils down to. Below, you’ll find a material design checklist that you can use to mark progress as you implement the new design system. The checklist is divided into 4 key sections based on the 4 key aspects of material design. If you include a good chunk of the items in the checklist below, especially the ones indicated as signature elements, and follow traditional Android design best practices (i.e. these, these, and things we discussed on ADiA), you’ll be well on your way to material design awesomeness! UIs consist of surfaces (pieces of “digital paper”) arranged at varying elevations, casting shadows on surfaces behind them. Figure 1. Surfaces and layering. Signature element: Shadows are used to communicate which surfaces are in front of others, helping focus attention and establish hierarchy. Read more on depth and layering in UIs. In code: This is the android:elevation and android:translationZ attribute in Android 5.0. On earlier versions, shadows are normally provided as PNG assets. Shadows and surfaces are used in a consistent and structured way. Each shadow indicates a new surface. Surfaces are created thoughtfully and carefully. There are generally between 2 and 10 surfaces on the screen at once; avoid too much layering/nesting of surfaces. Scrollable content either scrolls to the edges of the screen or behind another surface that casts a shadow over the content’s surface. Never clip an element against an invisible edge—elements don’t just scroll off into nowhere. Put another way, you rarely scroll the ink on a surface; you scroll the surface itself. In code: android:clipToPadding=false often helps with this when using ListView and ScrollView. Surfaces have simple, single-color backgrounds. The “digital ink” you draw on those pieces of digital paper is informed by classic print design, with an emphasis on bold use of color and type, contextual imagery, and structured whitespace. Figure 2. Primary and accent colors. Signature element: Apps use a primary color and an accent color (Figure 2) to color surface backgrounds and key UI widgets such as text fields and checkboxes. The accent color contrasts very well with the primary color (for example an app can use a dark blue primary color and a neon pink accent color). The accent color is high-contrast and is used to call attention to key UI elements, like a circular floating action button, selected tab strips, or form fields. In code: Set the android:colorPrimary and android:colorAccent attributes in your theme (drop the android prefix if using AppCompat). AppCompat automatically colors text fields, checkboxes, and more on pre-L devices. Signature element: On Android 5.0, the status bar is colored to match the app’s primary color, or the current screen’s content. For full-bleed imagery, the status bar can be translucent. In code: Set the android:colorPrimaryDark or android:statusBarColor attribute in your theme (drop the android prefix if using AppCompat) or call Window.setStatusBarColor. Icons, photos/images, text, and other foreground elements are colored “ink” on their surfaces. They don’t have shadows and don’t use gradients. Colors extracted from images can be used to color adjacent UI elements or surfaces. In code: This can be done using the Palette support library. Signature element: Icons in the app follow the system icon guidelines, and standard icons use the material design icon set. Photos are generally immersive and full-bleed. For example, for detail screens, run edge-to-edge and can even appear behind the app bar or status bar. In code: The new Toolbar widget (and its AppCompat equivalent) can be transparent and placed directly in your layout. For the status bar, check this Stack Overflow post. Signature element: Where appropriate, elements like body text, thumbnails, app bar titles, etc. are aligned to 3 keylines (Figure 3). On phones, those keylines are 16dp and 72dp from the left edge and 16dp from the right edge of the screen. On tablets those values are 24dp and 80dp. UI elements are aligned to and sized according to an 8dp baseline grid. For example, app bars are 56dp tall on phones and 64dp tall on tablets. Padding and margins can take on values like 8dp, 16dp, 24dp, etc. More precise text positioning uses a 4dp grid. Motion helps communicate what’s happening in the UI, providing visual continuity across app contexts and states. Motion also adds delight using smaller-scale transitions. Motion isn’t employed simply for motion’s sake. In general, UI and content elements don’t just appear or disappear—they animate into place, either together as a unit, or individually. Signature element: When touching an item to see its details, there’s a “hero” transition (Figure 4) that moves and scales the item between its position in the browsing screen and its position in the detail screen. In code: These are called “shared element transitions” in the SDK. The support version of FragmentTransaction also includes some shared element support. Signature element: Ripple effects originating from where you touched the screen are used to show touch feedback on an item. In code: The default android:selectableItemBackground and android:selectableItemBackgroundBorderless have this, or you can use RippleDrawable (<ripple>) to customize the effect. On pre-5.0 devices, ripples aren’t an expected feature, so defer to the default android:selectableItemBackground behavior. Signature element: UI elements can appear using a circular “reveal” animation. In code: See this doc or the ViewAnimationUtils class for more. Signature element: Animations are used in more subtle, delightful ways, such as to convey the transition between icon states or text states. For example, a “+” icon can morph into an “x” symbol, or an outlined heart icon can be filled using a paint-bucket fill effect. In code: Icon transitions can be implemented using AnimatedStateListDrawable and its XML counterpart. An example can be found in the Google I/O app source. There’s also support for animated vector icons. Animations and transitions are fast—generally under 300ms. Crossfades are often replaced by translate/slide transitions: vertical slides for descendant navigation and horizontal slides for lateral navigation. For slide transitions, prefer quick acceleration and gentle ease-in deceleration over simple linear moves. See the material design spec on motion for more. Tangible surfaces, bold graphic design, and meaningful motion work together to bring a consistent experience across any screen, be it phones, tablets, laptops, desktops, TVs, wearables, or even cars. Additionally, the key UI patterns below help establish a consistent character for the app across devices. Figure 5. The floating action button. The app uses responsive design best practices to ensure screens lay themselves out appropriately on any screen size, in any orientation. See the Tablet App Quality Checklist for a list of ways to optimize for tablets, and this blog post for high-level tablet optimization tips. 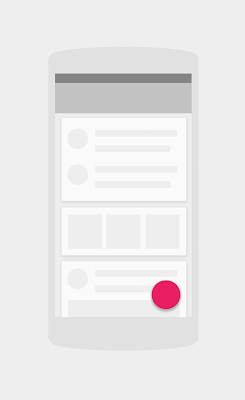 In material design, detail screens are often presented as popups that appear using “hero” transitions (see above). In multi-pane layouts, the app can use multiple toolbars to place actions contextually next to their related content. Signature element: Where appropriate, the app promotes the key action on a screen using a circular floating action button (FAB). The FAB (Figure 5) is a circular surface, so it casts a shadow. It is colored with a bright, accent color (see above). It performs a primary action such as send, compose, create, add, or search. It floats in front of other surfaces, and is normally at an 8dp elevation. It frequently appears at the bottom right of the screen, or centered on an edge where two surfaces meet (a seam or a step). Signature element: The app uses a standard Android app bar. The app bar doesn’t have an app icon. Color and typography are used for branding instead. The app bar casts a shadow (or has a shadow cast on it by a surface below and behind it). The app bar normally has a 4dp elevation. 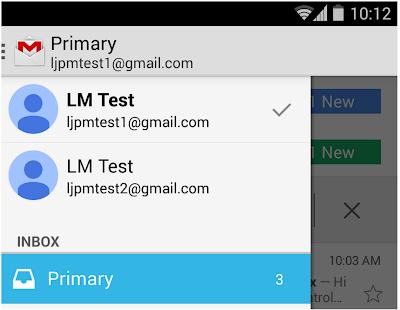 In code: Use the new Toolbar widget in Android 5.0 that is placed directly into the activity’s view hierarchy. AppCompat also provides android.support.v7.widget.Toolbar, which supports all modern platform versions. The app bar might be for example 2 or 3 times taller than the standard height; on scroll, the app bar can smoothly collapse into its normal height. The app bar might be completely transparent in some cases, with the text and actions overlaying an image behind it. For example, see the Google Play Newsstand app. In code: when using the Toolbar widget, use the android:contentInsetStart attribute. Where appropriate, upon scrolling down, the app bar can scroll off the screen, leaving more vertical space for content. Upon scrolling back up, the app bar should be shown again. Figure 6. Tabs with material design. Signature element: Tabs follow the newer material design interactions and styling (Figure 6). There are no vertical separators between tabs. If the app uses top-level tabs, tabs are visually a part of the app bar; tabs are a part of the app bar’s surface. 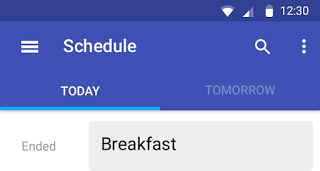 In code: See the SlidingTabsBasic sample code in the SDK or the Google I/O app source (particularly the "My Schedule" section for phones). Tabs should support a swipe gesture for moving between them. In code: All tabs should be swipeable using the ViewPager widget, which is available in the support library. Selected tabs are indicated by a foreground color change and/or a small strip below the tab text (or icon) colored with an accent color. The tab strip should smoothly slide as you swipe between tabs. Signature element: If the app uses a navigation drawer, it follows the newer material design interactions and styling (Figure 7). The drawer appears in front of the app bar. It also appears semitransparent behind the status bar. In code: Implement drawers using the DrawerLayout widget from the support library, along with the new Toolbar widget discussed above. See this Stack Overflow post for more. Signature element: The leftmost icon in the app bar is a navigation drawer indicator; the app icon is not visible in the app bar. Optionally, on earlier versions of the platform, if the app has a drawer, the top-left icon can remain the app icon and narrower drawer indicator, as in Android 4.0. Item heights in the drawer follow the baseline grid: 48dp tall rows, 8dp above list sections and 8dp above and below dividers. Text and icons should follow the keylines discussed above. More and more apps from Google and across the Google Play ecosystem will be updating with material design soon, so expect Winter 2014 to be a big quarter for design on Android. 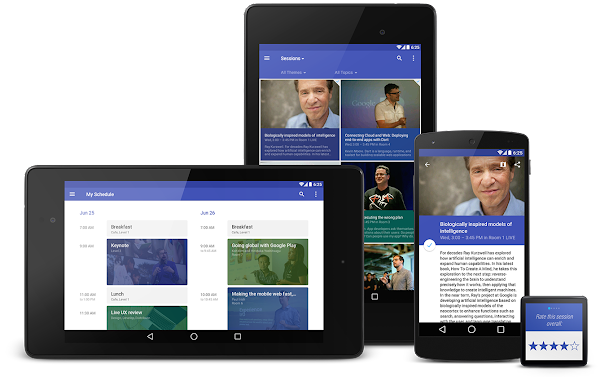 For more designer resources on material design, check out the DesignBytes series. 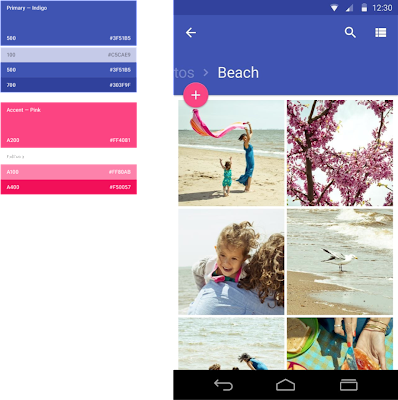 For additional developer resources, check the Creating Apps with Material Design docs! 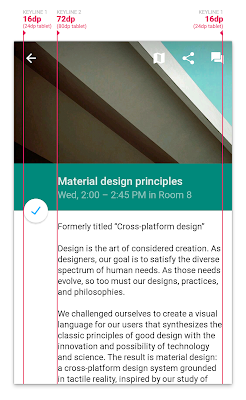 In material design, UIs are composed of pieces of digital paper & ink. The surfaces and the shadows they cast provide visual cues to the structure of the application, what you can touch and how it will move. This digital material can move, expand and reform to create flexible UIs. You can also set this from code using getElevation()/setElevation() (with shims in ViewCompat). The shadow a view casts is defined by its outline, which by default is derived from its background. For example if you set a circular shape drawable as the background for a floating action button, then it would cast an appropriate shadow. If you need finer control of a view’s shadow, you can set a ViewOutlineProvider which can customise the Outline in getOutline(). Cards are a common pattern for creating surfaces holding a distinct piece of information. The new CardView support library allows you to create them easily, providing outlines and shadows for you (with equivalent behaviour on prior platforms). CardView extends FrameLayout and provides default elevation and corner radius for you so that cards have a consistent appearance across the platform. You can customise these via the cardElevation and cardCornerRadius attributes, if required. Note that Cards are not the only way of achieving dimensionality and you should be wary of over-cardifying your UI! Material utilises classic principles from print design to create clean, simple layouts that put your content front and center. Bold deliberate color choices, intentional whitespace, tasteful typography and a strong baseline grid create hierarchy, meaning and focus. Android 5.0 updates the system font Roboto to beautifully and clearly display text no matter the display size. 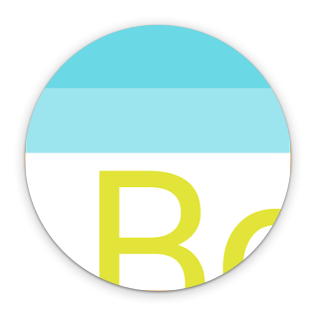 A new medium weight has been added (android:fontFamily=”sans-serif-medium”) and new TextAppearance styles implement the recommended typographic scale for balancing content density and reading comfort. For instance you can easily use the ‘Title’ style by setting android:textAppearance=”@android:style/TextAppearance.Material.Title”. These styles are available on older platforms through the AppCompat support library, e.g. “@style/TextAppearance.AppCompat.Title”. colorPrimary. The primary branding color for the app; used as the action bar background, recents task title and in edge effects. colorAccent. Vibrant complement to the primary branding color. Applied to framework controls such as EditText and Switch. colorPrimaryDark. Darker variant of the primary branding color; applied to the status bar. Further attributes give fine grained control over colorizing controls, see: colorControlNormal, colorControlActivated, colorControlHighlight, colorButtonNormal, colorSwitchThumbNormal, colorEdgeEffect, statusBarColor and navigationBarColor. AppCompat provides a large subset of the functionality above, allowing you to colorize controls on pre-Lollipop platforms. Tangible surfaces don’t just appear out of nowhere like a jump-cut in a movie; they move into place helping to focus attention, establish spatial relationships and maintain continuity. Materials respond to touch to confirm your interaction and all changes radiate outward from your touch point. All motion is meaningful and intimate, aiding the user’s comprehension. By declaring ‘shared elements’ that are common across two screens you can create a smooth transition between the two states. Here we define the same transitionName in two screens. When starting the new Activity and this transition is animated automatically. In addition to shared elements, you can now also choreograph entering and exiting elements. Custom views should propagate touch location down to their drawables in the View#drawableHotspotChanged callback so that the ripple can start from the touch point. Motion should be deliberate, swift and precise. Unlike typical ease-in-ease-out transitions, in Material Design, objects tend to start quickly and ease into their final position. Over the course of the animation, the object spends more time near its final destination. As a result, the user isn’t left waiting for the animation to finish, and the negative effects of motion are minimized. A new fast-in-slow-out interpolator has been added to achieve this motion. For elements entering and exiting the screen (which should do so at peak velocity), check out the linear-out-slow-in and fast-out-linear-in interpolators respectively. Our final core concept of material is creating a single adaptive design that works across devices of all sizes and shapes, from watches to giant TVs. Adaptive design techniques help us realize the vision that each device reflects a different view of the same underlying system. Each view is tailored to the size and interaction appropriate for that device. Colors, iconography, hierarchy, and spatial relationships remain constant. The material design system provides flexible components and patterns to help you build a design that scales. The toolbar is a generalization of the action bar pattern, providing similar functionality, but much more flexibility. Unlike the standard action bar, toolbar is a view in your hierarchy just like any other, so you can place instances wherever you like, interleave them with the rest of your views, animate, react to scroll events and so on. You can make the Toolbar act as your Activity’s Action Bar by calling Activity.setActionBar(). In this example, the blue toolbar is an extended height, overlaid by the screen content and provides the navigation button. Note that two further toolbars are used in the list and detail views. For details of implementing toolbars, see this post. 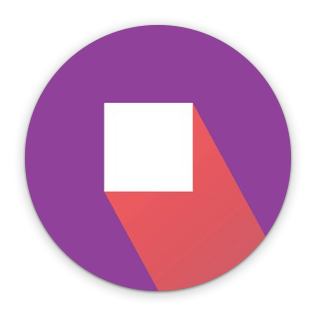 Material Design helps you to build understandable, beautiful and adaptive apps, which are alive with motion. Hopefully, this post has inspired you to apply these principles to your app and signposted some of the new (and compatibility) APIs to achieve this. 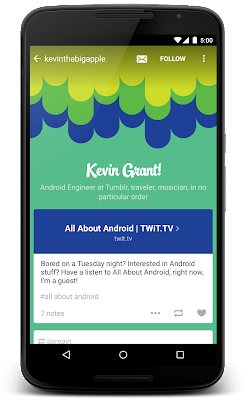 Updated material design Tumblr app on Nexus 6. Last week, we unveiled the Nexus 6 and Nexus 9, the newest additions to our Nexus family that will ship with Android 5.0 Lollipop. Together, they deliver a pure Google experience, showcasing fresh visual styles with material design, improved performance, and additional features. Let’s make sure your apps and games are optimized to give your users the best mobile experience on these devices. We’ve outlined some best practices below. The Nexus 6 boasts an impressive 5.96” Quad HD screen display at a resolution of 2560 x 1440 (493 ppi). This translates to ~ 730 x 410 dp (density independent pixels). It has a quantized density of 560 dpi, which falls in between the xxhdpi and xxxhdpi primary density buckets. For the Nexus 6, the platform will scale down xxxhdpi assets, but if those aren’t available, then it will scale up xxhdpi assets. Provide at least an xxxhdpi app icon because devices can display large app icons on the launcher. 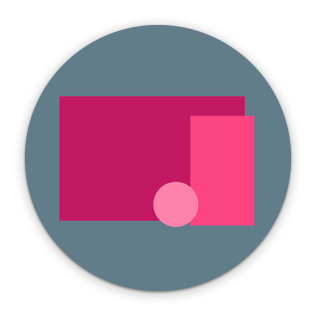 It’s best practice to place your app icons in mipmap- folders (not the drawable- folders) because they are used at resolutions different from the device’s current density. For example, an xxxhdpi app icon can be used on the launcher for an xxhdpi device. Choosing to add xxxhdpi versions for the rest of your assets will provide a sharper visual experience on the Nexus 6, but does increase apk size, so you should make an appropriate decision for your app. If you are using the <compatible-screens> element in the AndroidManifest.xml file, you should stop using it because it’s not scalable to re-compile and publish your app each time new devices come out. However, if you must use it, make sure to update the manifest to add the configuration for these devices (by screen size and density). Otherwise your app may be excluded from Google Play search results on these devices. The Nexus 9 is a premium 8.9” tablet with a screen size of 2048 x 1536 pixels (288 ppi), which translates to 1024 x 768 dip. This is a 4:3 aspect ratio, which is unique compared to earlier tablets. The Nexus 9 falls into the xhdpi density bucket, and you should already have assets in the drawable-xhdpi folder. 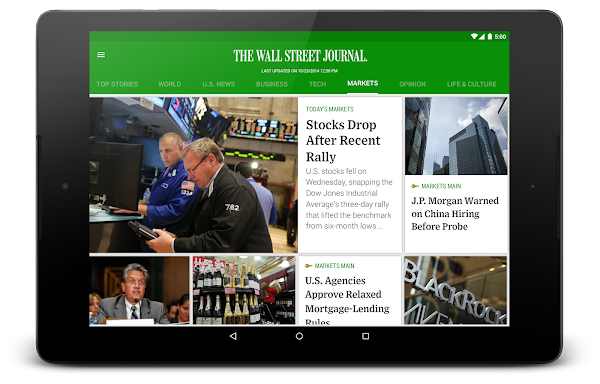 Updated Material Design Wall Street Journal app on Nexus 9. More detailed instructions are provided in the developer site. You can test your 64-bit enabled app on a physical device with a 64-bit processor running Android 5.0, or take advantage of the recently announced 64-bit emulator in Android Studio. The Nexus 9 Keyboard Folio will be available as an accessory in Google Play. It’s very important that you don’t lock your app to a single orientation. The Nexus 9’s natural orientation is portrait mode, while it’s used in landscape mode with the keyboard. If you lock to the device’s natural orientation, the app may appear sideways for devices with keyboards. Alternatively, shortcuts can be defined using Activity#onKeyShortcut or View#onKeyShortcut. Learn more about keyboard actions here. In order to take advantage of the screen real estate on the Nexus 6 and Nexus 9, we emphasize the importance of responsive design. In the past, if you assumed that landscape mode is significantly wider than portrait mode, you may run into problems on a device like the Nexus 9, which has an aspect ratio of 4:3. Instead of declaring layouts using the layout-land or layout-port resource folder qualifiers, we strongly recommend switching to the w<N>dp width resource folder qualifier so that content is laid out based on available screen width. Think about content first and foremost. Decide on min and max screen real estate that your content requires, and determine cutoff points at different screen widths where you can modify the layout composition for your app (# of grid columns, multi-pane layout, etc…). As for attributes based on form factor, instead of declaring them in values-large or values-xlarge resource directories, use the sw<N>dp smallest width qualifier. For example, you could style your TextViews to have a medium font size on phones. Meanwhile, TextViews could have a large font size when the smallest width of the device (taking the minimum of the landscape and portrait widths) is 600dp or wider. This ensures the font size of your app doesn’t change when you rotate this large screen device. Set your android:targetSdkVersion to "21". Take note of the important behavior changes in Android 5.0 Lollipop including ART, the new Android runtime, to ensure that your app continues to run well. You can also leverage new platform APIs like richer notifications. Nexus 6 and Nexus 9 users will be immersed in the new world of material design, and they’ll expect the same seamless transitions, bold colors, and delightful details from your app. As you invest time in bringing your app up to date with our latest design language, there’s a whole host of resources to help you make the leap, including important new updates to the support library, videos, and a getting started guide. Good luck and we can’t wait to see your apps! The Android 5.0 SDK was released last Friday, featuring new UI widgets and material design, our visual language focused on good design. To enable you to bring your latest designs to older Android platforms we have expanded our support libraries, including a major update to AppCompat, as well as new RecyclerView, CardView and Palette libraries. In this post we'll take a look at what’s new in AppCompat and how you can use it to support material design in your apps. In this release, Android introduces a new Toolbar widget. This is a generalization of the Action Bar pattern that gives you much more control and flexibility. Toolbar is a view in your hierarchy just like any other, making it easier to interleave with the rest of your views, animate it, and react to scroll events. You can also set it as your Activity’s action bar, meaning that your standard options menu actions will be display within it. You’ve likely already been using the latest update to AppCompat for a while, it has been included in various Google app updates over the past few weeks, including Play Store and Play Newsstand. It has also been integrated into the Google I/O Android app, pictured above, which is open-source. All of your Activities must extend from ActionBarActivity, which extends from FragmentActivity from the v4 support library, so you can continue to use fragments. All of your themes (that want an Action Bar/Toolbar) must inherit from Theme.AppCompat. There are variants available, including Light and NoActionBar. When inflating anything to be displayed on the action bar (such as a SpinnerAdapter for list navigation in the toolbar), make sure you use the action bar’s themed context, retrieved via getSupportActionBar().getThemedContext(). For more information, see the Action Bar API guide which is a comprehensive guide on AppCompat. You can now remove all of your values-v14+ Action Bar styles. When you set these attributes, AppCompat automatically propagates their values to the framework attributes on API 21+. This automatically colors the status bar and Overview (Recents) task entry. When running on devices with Android 5.0, all of the widgets are tinted using the color theme attributes we just talked about. There are two main features which allow this on Lollipop: drawable tinting, and referencing theme attributes (of the form ?attr/foo) in drawables. You don’t need to do anything special to make these work, just use these controls in your layouts as usual and AppCompat will do the rest (with some caveats; see the FAQ below). Use a Toolbar as an Action Bar when you want to use the existing Action Bar facilities (such as menu inflation and selection, ActionBarDrawerToggle, and so on) but want to have more control over its appearance. Use a standalone Toolbar when you want to use the pattern in your app for situations that an Action Bar would not support; for example, showing multiple toolbars on the screen, spanning only part of the width, and so on. To use Toolbar as an Action Bar, first disable the decor-provided Action Bar. The easiest way is to have your theme extend from Theme.AppCompat.NoActionBar (or its light variant). The height, width, background, and so on are totally up to you; these are just good examples. As Toolbar is just a ViewGroup, you can style and position it however you want. From this point on, all menu items are displayed in your Toolbar, populated via the standard options menu callbacks. The difference in standalone mode is that you do not set the Toolbar to act as your action bar. For this reason, you can use any AppCompat theme and you do not need to disable the decor-provided Action Bar. There are many other things you can do with Toolbar. For more information, see the Toolbar API reference. AppCompat offers Lollipop’s updated SearchView API, which is far more customizable and styleable (queue the applause). We now use the Lollipop style structure instead of the old searchView* theme attributes. You do not need to set all (or any) of these, the defaults will work for the majority of apps. Hopefully this post will help you get up and running with AppCompat and let you create some awesome material apps. Let us know in the comments/G+/Twitter if you’re have questions about AppCompat or any of the support libraries, or where we could provide more documentation. You are creating the EditText without a LayoutInflater (i.e., calling new EditText()). The special tint-aware widgets are currently hidden as they’re an unfinished implementation detail. This may change in the future. Why has X widget not been material-styled when running on pre-Lollipop? Only some of the most common widgets have been updated so far. There are more coming in future releases of AppCompat. Why does my Action Bar have a shadow on Android Lollipop? I’ve set android:windowContentOverlay to null. On Lollipop, the action bar shadow is provided using the new elevation API. To remove it, either call getSupportActionBar().setElevation(0), or set the elevation attribute in your Action Bar style. Why are there no ripples on pre-Lollipop? A lot of what allows RippleDrawable to run smoothly is Android 5.0’s new RenderThread. To optimize for performance on previous versions of Android, we've left RippleDrawable out for now. How do I use AppCompat with Preferences? You can continue to use PreferenceFragment in your ActionBarActivity when running on an API v11+ device. For devices before that, you will need to provide a normal PreferenceActivity which is not material-styled. 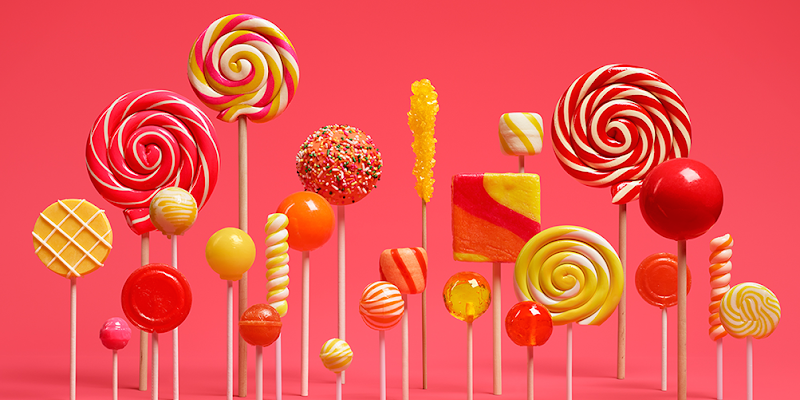 Android 5.0 Lollipop is the biggest update of Android to date, introducing an all new visual style, improved performance, and much more. Android 5.0 Lollipop also extends across screens big and small, including phones, tablets, wearables, TVs and cars, to give your users access to information when they need it most. To get you started on developing and testing on Android 5.0 Lollipop, here are some of the developer highlights with links to related videos and documentation. Material design for the multiscreen world — Material Design is a new approach for designing apps in today’s multi-device world that takes a comprehensive strategy to visual, motion, and interaction design across a number of platforms and form factors. Android 5.0 brings Material Design to the platform, with a full set of tools for implementing material design in your apps. The system is incredibly flexible, allowing your app to express its individual character and brand with bold colors and a variety of responsive UI patterns and themeable elements. Enhanced notifications — New lockscreen notifications let you surface content, updates, and actions to users at a glance, without needing to unlock their device. Heads-up notifications let you display content and actions in a small floating window managed by the system, no matter which app is in the foreground. Notifications are refreshed for Material Design and you can use accent colors to express your brand. Concurrent documents in Overview — Now you can organize your app by tasks and present these concurrently as individual “documents” on the Overview screen. For example, instant messaging apps could declare each chat as a separate document. Users can flip through these on the Overview screen to find the specific chat they want and jump straight to it. Android Runtime (ART) — Android 5.0 runs exclusively on the ART runtime. ART offers ahead-of-time (AOT) compilation, more efficient garbage collection, and improved development and debugging features. In many cases it improves performance of the device, without you having to change your code. 64-bit support — Support for 64-bit ABIs provides additional address space and improved performance with certain compute workloads. Apps written in the Java language can run immediately on 64-bit architectures with no modifications required. NDK r10c includes 64-bit support, for apps and games using native code. Project Volta — New tools and APIs help you build battery-efficient apps. Battery Historian, a tool included in the SDK, lets you visualize power events over time and understand how your app is using battery. The JobScheduler API lets you set the conditions under which your background tasks and other jobs should run, such as when the device is idle or connected to an unmetered network or to a charger, to minimize battery impact. More in this I/O video. OpenGL ES 3.1 and Android Extension Pack — With OpenGL ES 3.1, you get compute shaders, stencil textures, and texture gather for your games. Android Extension Pack (AEP) is a new set of extensions to OpenGL ES that bring desktop-class graphics to Android including tessellation and geometry shaders, and use ASTC texture compression across GPU technologies. More on what's new for game developers in this DevBytes video. WebView updates — We’ve updated WebView to support WebRTC, WebAudio and WebGL will be supported. WebView also includes native support for all of the Web Components specifications: Custom Elements, Shadow DOM, HTML Imports, and Templates. WebView is now unbundled from the system and will be regularly updated through Google Play. Managed provisioning and unified view of apps — to make it easier for employees to have a single device for personal and work use, framework enhancements offer a unified view of apps, notifications & recents across work apps and personal apps. Profile owner APIs, in the workplace context, let administrators create and manage work profiles and defined as part of a new managed provisioning process. More in this I/O video. Advanced camera capabilities — A new camera API gives you new capabilities for advanced image capture and processing. On supported devices, your app can capture uncompressed YUV capture at full 8 megapixel resolution at 30 FPS. You can also capture raw sensor data and control parameters such as exposure time, ISO sensitivity, and frame duration, on a per-frame basis. Audio improvements — The sound architecture has been enhanced, with lower input latency in OpenSL, the addition of multichannel-mixing, and USB digital audio mode support. More in this I/O video. BLE Peripheral Mode — Android devices can now function in Bluetooth Low Energy (BLE) peripheral mode. 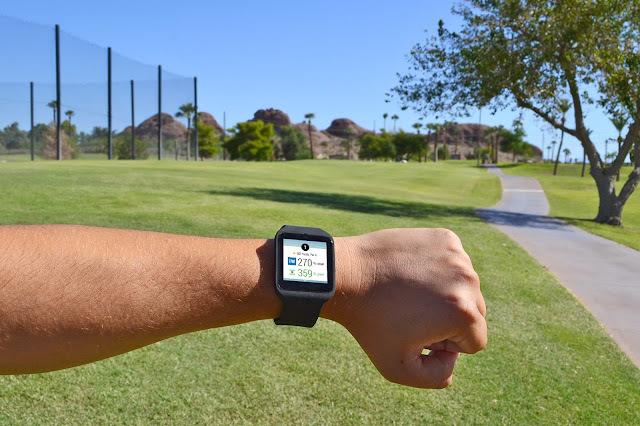 Apps can use this capability to broadcast their presence to nearby devices — for example, you can now build apps that let a device function as a beacon and transmit data to another BLE device. More in this I/O video. Multi-networking — Apps can dynamically request networks based on capabilities such as metered or unmetered. This is useful when you want to use a specific network, such as cellular. Apps can also request platform to re-evaluate networks for an internet connection. This is useful when your app sees unusually high latency on a particular network, it can enable the platform to switch to a better network (if available) sooner with a graceful handoff. You can get started developing and testing on Android 5.0 right away by downloading the Android 5.0 Platform (API level 21), as well as the SDK Tools, Platform Tools, and Support Package from the Android SDK Manager. 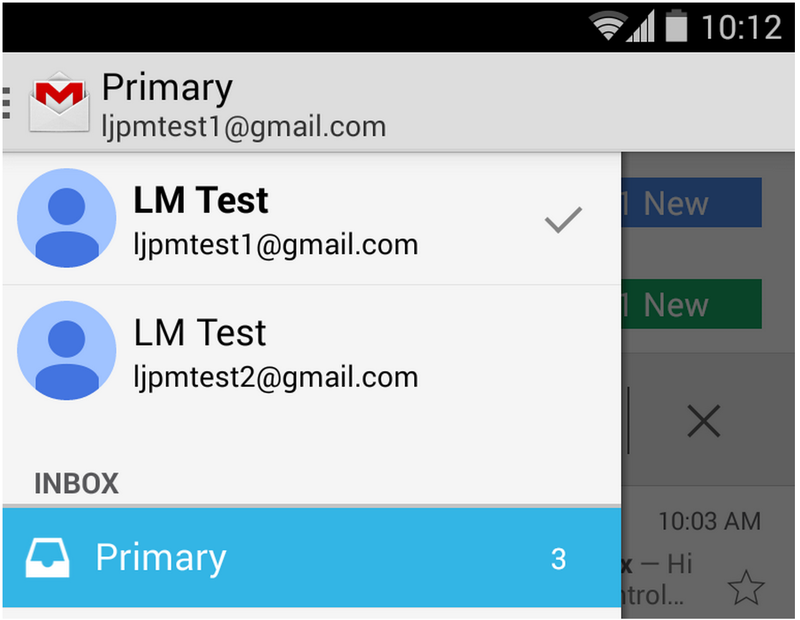 Check out the DevByte video below for more of what’s new in Lollipop!